The Pieve (Parish church) of San Donato a Mugnana is mentioned in documents dating from the 12 C, but it was built in about the year 1000. The church is located near the Castle of Mugnana. From the church an uphill path leads to a hill top where there is a shrine of Our Lady. The road continues on towards Chiocchio, whose church is Santa Maria a Chiocchio. The Church of San Donato a Mugnana stands on land that was owned by the Bardi of Vernio. It has undergone several renovations between the 14 C, when the church was restored in Romanesque style, up until the rennovations of 1934. Not far from the church there is a small cemetery that has been restored in recent times. On the exterior of the church, above the entrance, there is a lunette depicting the Madonna. 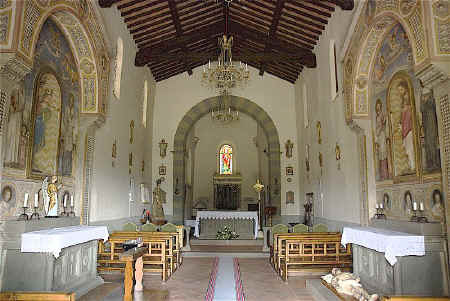 Inside, the church has a single nave with altars of pierta serena in the side walls, along which there is also the Via Crucis, the high altar and an organ. The relics of St. Martyr Prime and some reliquaries are located in the sacristy. There are frescoes by an unknown artist representing San Francesco de Sales, St. Margaret, San Giovanni Bosco, St. Bernard of Clairvaux, St. Jerome, St. Ambrose, St. Gregory and St. Augustine. In the rectory there are paintings of San Donato, San Gregorio Magno and Clement VII by Nicodemo Ferrucci and the Healing of the Blind by Sagrestani. Other furnishings include six gilt-framed mirrors and a wooden bust of San Donato. The church also houses a single capital (a 'capitello erratico') with carvings of goats and symbolic motifs (stellate flowers, palms). A 17 C painting representing the Rest on the Flight into Egypt that is now housed in the church of Santa Maria a Chiocchio came from this church. The painting was commissioned by Carlo Bardi di Vernio, a musician, writer and artist. At the bottom of this picture is the inscription: "Carolus comes Vernio donavit 1616" and, further down: "Et Jacobus Pecci restauravit P.1815". The painting shows the Virgin seated under a tree with the Child in her arms and St. Joseph leaning on a wall. The background consists of monuments and columns, while in the foreground there is a basket with a cloth. This painting is a copy of the Holy Family by Andrea del Sarto, in the Galleria Barberini in Rome, and is attributed to the Tuscan School. Make the best of your vacation in Tuscany! Learn some Italian from a professional Italian language teacher in Chianti. Even one or two lessons will greatly enhance your enjoyment of Tuscany. More about Italian lessons in Tuscany. Chiocchio © ammonet InfoTech 2005 - 2018. All rights reserved.